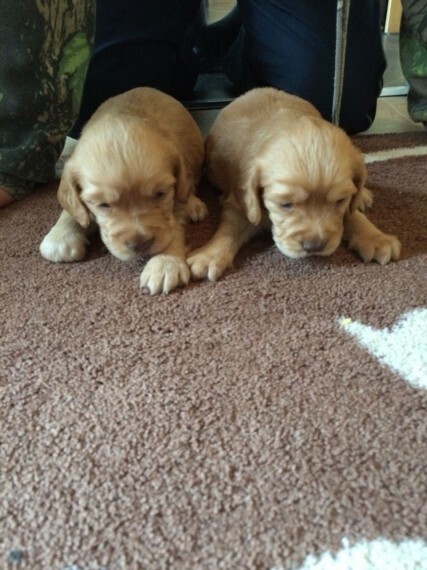 TWO WORKING COCKER GIRS AVAILABLE NOT DOCKED OR KC REGISTERED.. These cracking little puppies have been bred from extremely good Working stock. Sire and dam both have many FTCH through out their Lines names include ARGYLL WARRIOR.. MALLOWDALE.. MAESYDDEREEN.. AND WERNFFRWD LINES. Mum is very obedient keen little dog she is small and compact and is a very loyal family member. And dad is also a loyal member. both parents have fantastic temperaments. These puppies are a fine example of their breed and will make brilliant little working dogs or loyal companion to any family they will have a good start in life as they will all receive their first vaccination. will be microchipped. treated with advocate. along with a full veterinary health check. wormed regularly. will leave with 4 weeks health insurance. and will be weaned on to a high quality dry food called Royal Canin. They will be well socialised and very confident Strong healthy puppies 250 deposit will secure your choice of pup. Genuine call..s only please no tex or withheld numbers.. Call anytime for more information.